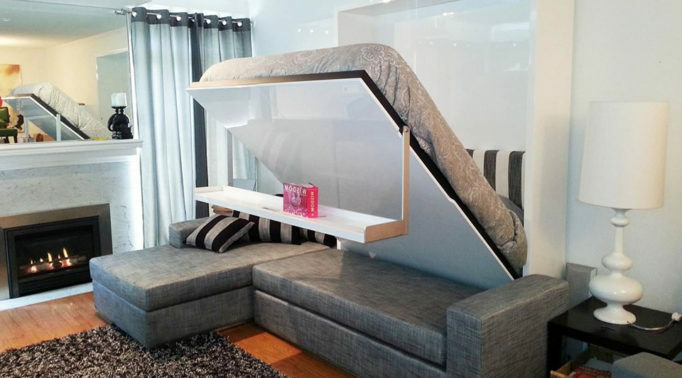 Clean, durable, resistant to odour absorption and modern designs. While the majority of laundry bins are made of plastic or natural materials such as wicker or wood, stainless steel hampers have a number of advantages. They’re easier to keep clean, resistant to odour absorption, and they’re more durable. Very few plastic or wicker laundry hampers can match the resiliency provided by metal. 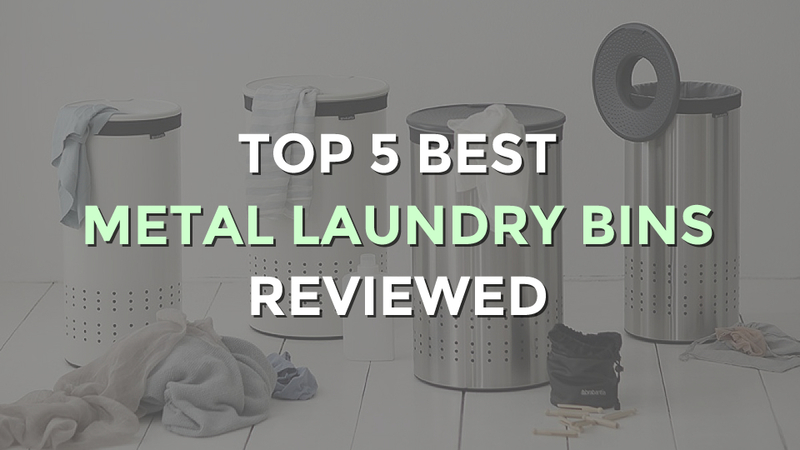 Here are our top 5 best metal laundry bins to handle the family laundry, while also complementing your decor, as metal hampers offer sleek and stylish designs for the modern home, moreso than their plastic or wicker counterparts. One thing that is especially nice about choosing a metal laundry hamper is that sometimes they will have some unique and clever features. 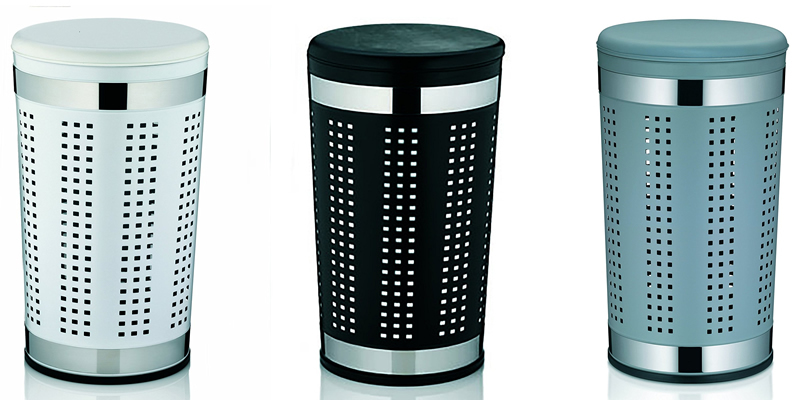 The Kela Sevilla Seat Metal Laundry Bin is made from powder-coated metal and high-grade steel with a cushion top lid so that the hamper can do double duty as a comfy bath stool. This hamper comes in three neutral colours – black, white, and bright grey – so it’s easy to find the right one to go along with your current bathroom decor. 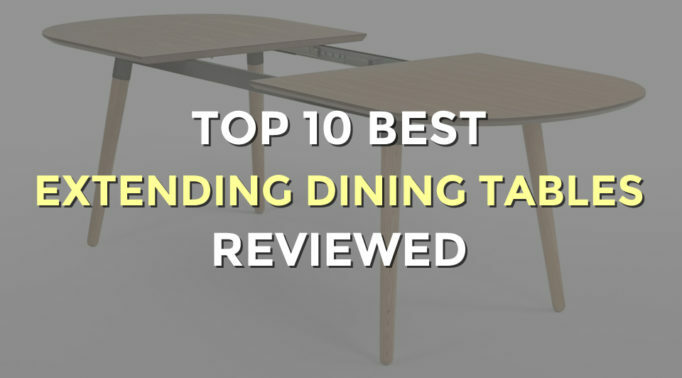 The slim and round design stands at 60.5cm, so it’s just the right height for sitting, and the ventilation holes extend from top to bottom so as to prevent any odour or mildew build-up inside. 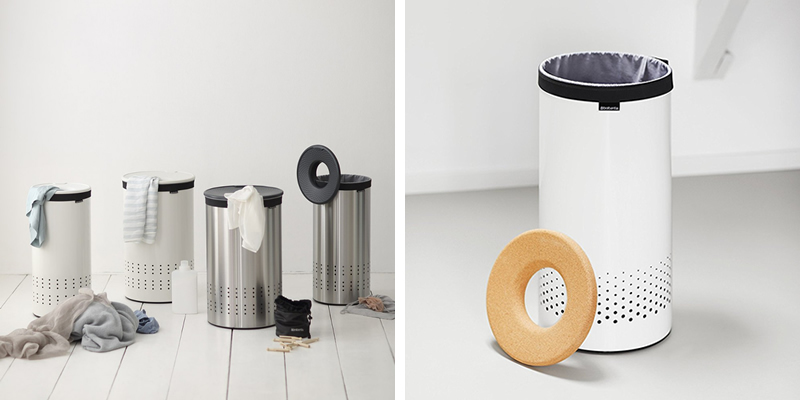 The Zeller Metal Laundry Bin incorporates a clean-looking, minimalist design. 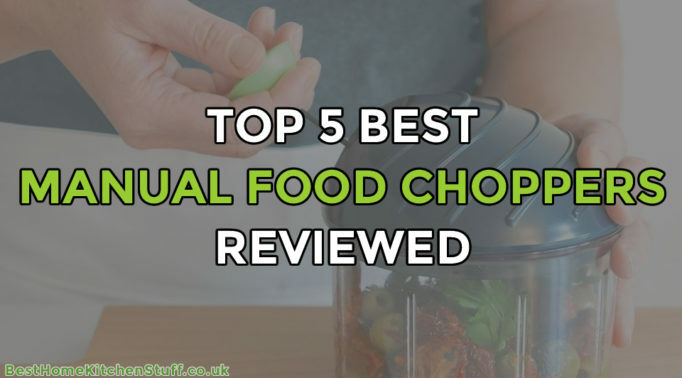 The bright white body is constructed from powdered metal and the silver stainless steel lid combine to make up a simple and sturdy bin that is made to last. 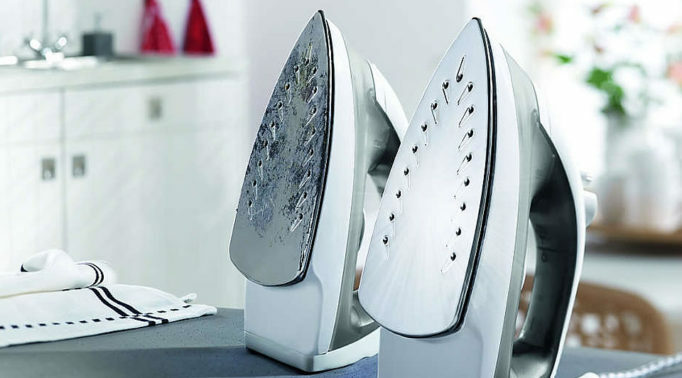 In addition, the stainless steel rim provides even more stability. 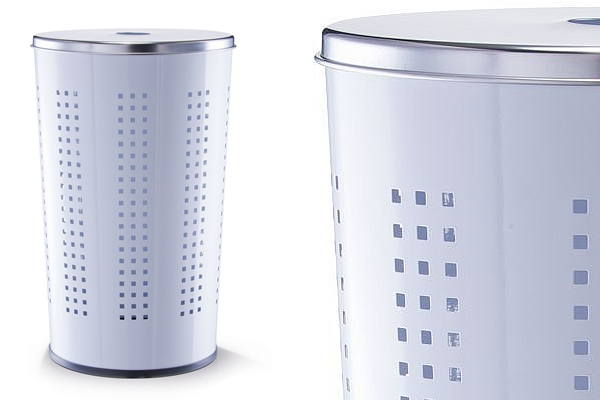 This metal laundry bin has a capacity of 46 litres, a height of 60 centimetres, and plenty of holes throughout the body to ensure excellent air circulation. 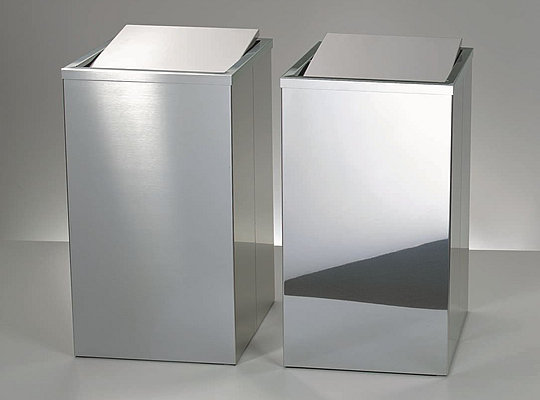 One of the best metal laundry bins with a simplistic yet chic and sophisticated design is the Decor Walther Stainless Steel Laundry Bin. 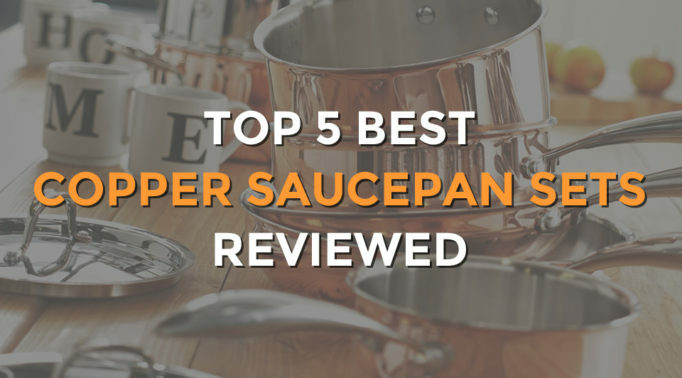 The polished surface goes wonderfully with chrome or polished steel bath fixtures and the revolving swing lid gives another bit of added convenience. This rectangular bin stands at 58cm and despite it being likened to a industrial and commercial laundry bin, it’s one of the most practical ways to handle the laundry of any busy household. Useful and practical, the Brabantia Selector Double Laundry Bin is ideal for fast paced households that want to save time on doing the laundry. 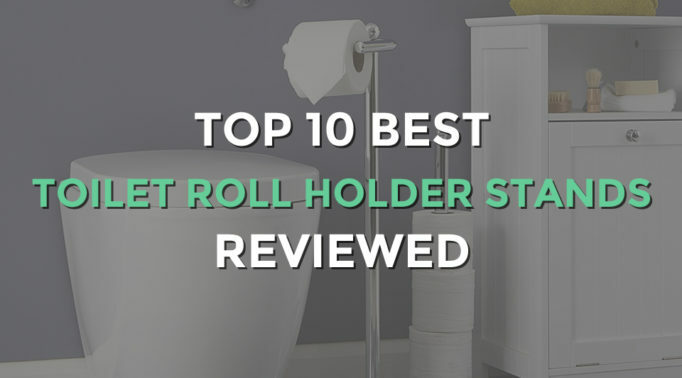 It has a 55L capacity and a flat back so that it can stand flush against a wall or cabinet, saving you space in your bedroom, bath, nursery, or laundry area. This metal laundry bin comes in white or matt steel and has a handy removable laundry bag that fits inside with two compartments so that you can separate clothes as you go, making laundry day that much easier. The removable bag is made of durable and washable cotton that lifts out easily for cleaning, and has a Velcro closure to hold it in place inside the bin. The lid – which is also removable – can be hooked onto the outer edge for convenience when removing your laundry. The Brabantia Selector Double Laundry Bin also has the necessary ventilation holes, and for some added protection for your flooring, a protective plastic ring at its base. The Brabantia Stainless Steel Laundry Bin is highly functional while also looking smart and stylish. There are a variety of colours to match your home decor, ranging from white, matt or brilliant steel, and a soothing mint green. This stainless steel hamper also has a lid that clips to the outer edge, and a removable cotton laundry bag so that laundry can be easily carried across the house or out to the launderette. 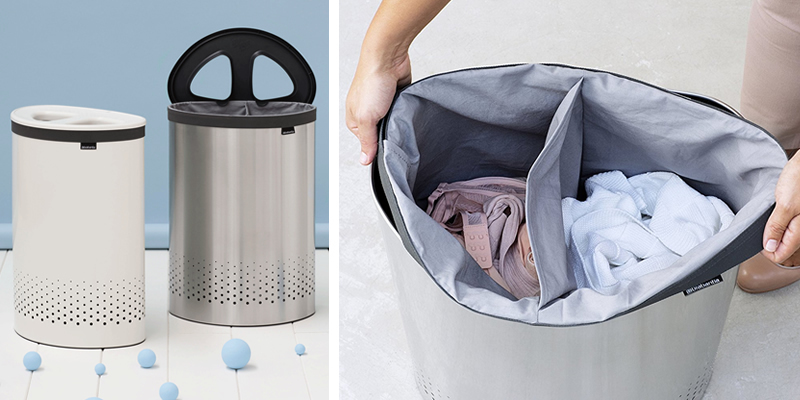 Among the many practical features of this laundry bin, there is also a clever lid design which allows you to quickly drop clothes in while still keeping soiled laundry out of sight. You can choose from a plastic or cork lid, and from a 35 or 60 litre capacity for even more personalisation, ensuring that you have the best metal laundry bin to suit your household needs.